After two unsuccessful attempts against Dartmouth College and Merrimack College over the last week, the No. 2/3 Boston University men’s hockey team finally matched its win total from the 2013-14 campaign, besting the Warriors 4-2 Saturday night at Agganis Arena. The Terriers (10-3-2, 7-1-2 Hockey East) scored four goals over the first two periods to pad a comfortable cushion against the Warriors (10-5-2, 4-4-1 Hockey East), with junior forward Danny O’Regan notching his first collegiate hat trick in the process. Less than a week after seeing his 10-game point streak come to an end against Dartmouth (5-4-1), O’Regan acclimated himself back on the BU box score Saturday, lighting the lamp three times en route to his first-career hat trick and four-point game. The San Jose Sharks draft pick was a constant presence on offense anytime he was out on the ice, leading the team with 10 shots while compiling a plus-4 rating. 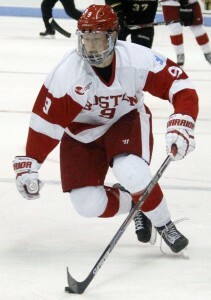 O’Regan’s most notable play might have been his first tally, as the junior skated his way into the slot, picked up a centering feed from freshman center Jack Eichel and deked past Merrimack goaltender Collin Delia before depositing the puck by way of a backhand shot into the Warriors’ net. Standing at 21 points (11 goals, 10 assists) on the year, O’Regan is tied for first in Hockey East in goals and is just one point off his total scoring output from last season. Reports of Eichel’s demise are greatly exaggerated. After being held pointless in three of BU’s last four games, the freshman center tallied four assists against the Warriors — his second four-point showing this season (Oct. 10 at UMass-Amherst). Eichel, who was named Hockey East Player of the Month on Wednesday, paces all Hockey East skaters in points (25), assists (17) and plus-minus (plus-20). Entering Saturday’s game tied for the team lead in points amongst defenseman (seven) freshman defenseman Brandon Hickey’s strong first-half play was finally rewarded when the Leduc, Alberta native notched his first collegiate goal at 2:46 in the second period. 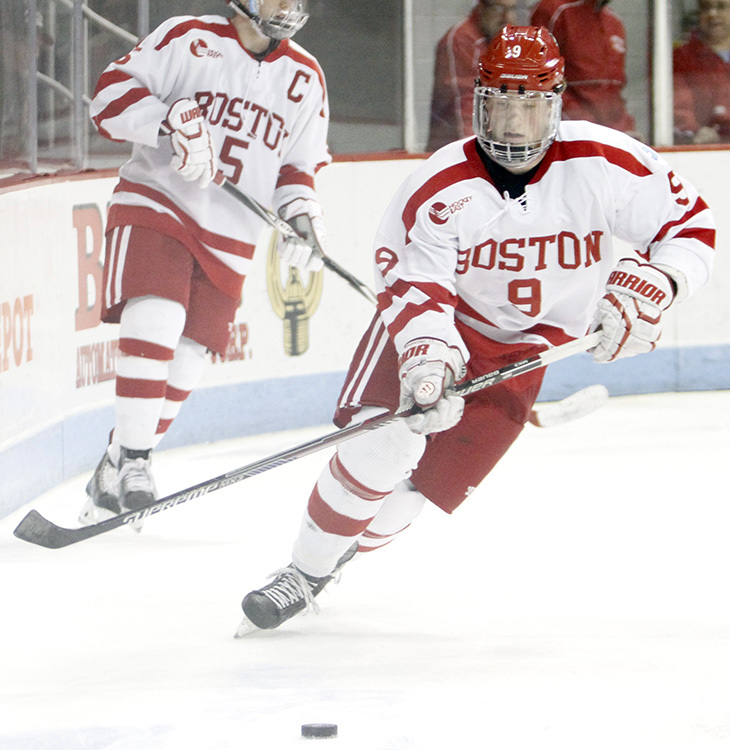 After entering into Warrior’s zone, Eichel sent off a centering pass to a trailing Hickey, who promptly roofed the puck over Merrimack goaltender Collin Delia’s right shoulder to give BU a commanding 3-0 lead. For more on Hickey’s performance and the strong play from BU’s first-year blueliners this season, check out Sarah’s sider. While the Terriers entered the second intermission with a comfortable three-goal advantage, a costly play from sophomore defenseman Doyle Somerby could have changed the entire complexion of the third period. The Marblehead native was flagged for both a game misconduct and a five-minute major penalty after crushing freshman Brett Seney into the boards behind the BU net at 6:34 in the final stanza. While the Terriers penalty-kill unit negated the Warriors’ extended power-play, Merrimack would eventually cut the deficit to two after forward Brian Christie scored his second goal of the game at 14:45. In what has been a major departure from a prevalent narrative this season, the Terriers’ dragged themselves to the finish line over the final 20 minutes of play. For the first time all season, BU was outscored in the third period, with Christie’s score standing as the only mark for either team in the final stanza. While BU outshot the Warriors by a 34-20 margin over the first 40 minutes of play, both squads settled for 12 shots apiece in the third, thanks in large part to four BU penalties. ORONO, Maine — Almost exactly a year ago to the day, the Boston University men’s hockey team was manhandled by the University of Maine in Alfond Arena, dropping a 7-0 decision to the Black Bears on Nov. 15, 2013. No. 3 BU (6-1-1, 4-1-1 Hockey East) avenged its previous drubbing Friday night, as the Terriers bested the Black Bears (3-7-1, 2-3 Hockey East) by a score of 3-1 in front of a packed rink in Orono, Maine. After entering the first intermission facing a 1-0 deficit, the Terriers would net three goals over the game’s final 40 minutes to improve their record to 4-0 when playing away from the friendly confines of Agganis Arena. Special teams play was a key component to the Terriers’ success Friday night, with the team’s penalty kill unit in particular making its presence felt against the Black Bears. The Terriers, who entered the match ranked 27th nationally in penalty-kill percentage (.853), thwarted all three of Maine’s chances on the man advantage due to a combination of strong play from goaltender Matt O’Connor and a stout net-front presence. The Terriers penalty kill also paid dividends on the box score, as BU manufactured a shorthanded tally in the final minute of the second period. Freshman forward Jack Eichel recovered the puck in BU’s zone and sailed by three Maine skaters before sending the biscuit across the crease of the Black Bears’ net to junior forward Danny O’Regan, who beat goalie Sean Romeo to give BU a 2-1 lead at 19:46. After crumbling last weekend due to an injury to junior forward Ahti Oksanen, BU’s “OREO” line returned once again and — in what has been a recurring trend this season — dominated the competition. Oksanen, O’Regan and Eichel scored all three of BU’s goals on the night, with Oksanen getting the Terriers on the board at 8:48 in the second with a power-play tally. “It was huge, it was huge because our power play hasn’t been great,” Quinn said of Oksanen’s goal. “We haven’t had a lot of them, but our power play hasn’t been great. And I thought that we really did a much better job getting pucks to the net. Quinn acknowledged after the game that skating at Alfond Arena as an opposing player can be intimidating enough for any individual. Adding in the fact that the boisterous Maine crowd was further buoyed by a pregame ceremony honoring the Black Bears’ 1999 NCAA Championship team, the Terriers were forced to hold their own against an energized Maine squad over the opening minutes of Friday’s game. The Terriers were pushed back on their heels for most of the first five minutes of game thanks to an effective Maine forecheck, giving the Black Bears a chance to draw first blood in the game. At just 1:13 in the first period, Maine winger Connor Leen glided into the BU defensive zone, firing a wrist shot towards O’Connor near the right circle. While the BU netminder turned the initial attempt aside, Leen potted in the resulting rebound into the BU net to dig the Terriers an early hole. While Maine did not add to its scoring column in the second period, there were chances aplenty. Multiple times throughout the 20 minutes of play, the Black Bears were given potential gift-wrapped goals as a result of poor BU line changes. Thankfully for the Terriers, key saves from O’Connor allowed the Terriers to claw back into Friday’s contest.